Hello Blog followers, it is I, Martin, your humble BIObus crew member here to enthrall you with yet another gripping regalement of our adventures around Northern British Columbia. If you are following these blogs with the weekly hunger that draws you back to read these blogs for every post you may remember that last week I spellbindingly explained the safety behind meeting our large furry friend, the bear, in the woods. This week I’ll go a little deeper in to what I very much enjoy doing on the BIObus. A Hover Fly majestically hovering next to a plant. 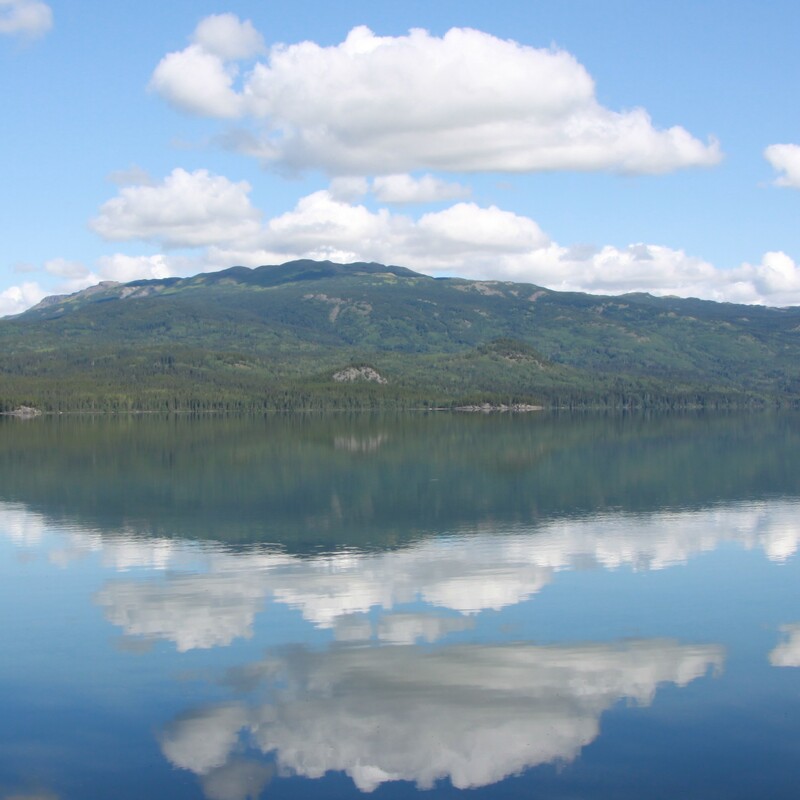 A reflection of the mountains and clouds in Kinaskan Lake. For a very long time I’ve always been fascinated by the photographic art. Taking photography in high school defiantly sparked my creativity and helped me pick up some interesting techniques. It is because of this hobby of mine I found myself working in imaging back at the lab in Guelph. It is with this stylish art I find myself on the BIObus capturing our work and other fascinating things that peak my interest. This week we spent our time working in Kinaskan Provincial Park. Kinaskan is a small park, you may have some trouble finding it on a map but that doesn’t mean it has nothing to offer, on the contrary, Kinaskan surprised me with its majestic mountains and spectacular lake view. The animals are plentiful, more birds than you can shake a stick at, though I’m not sure why you would, the insects are beautiful and the scenery is spectacular. It’s no surprise that I began to snap way more pictures than usual. When we went out to collect insects to take back to the lab I couldn’t stop myself from bringing every lens we owned, a macro lens to shoot insects, a wide lens to shoot scenery and a telephoto to shoot birds that are just too far away. It was here that I got to shoot some of my favourites from this trip so far and one of those is included as one of the photos posted to the side. But that day wasn’t the end of my photographing spree, the very next day happened to be a sunny day with almost no wind and the view of the lake went from remarkable to almighty. I may have spent longer than I’d care admit snapping pictures of the mountains and clouds reflected in the water. But by far my favourite picture taking session was the night when the sky was clear and the stars shown in brilliant white. 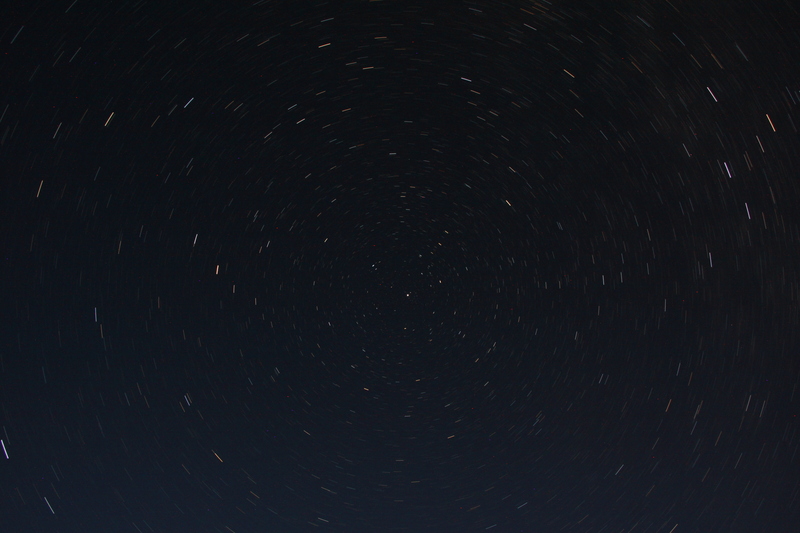 A picture of the stars seemingly spinning around Polaris, The North Star. It was that night that I alone snuck out of the RV at one o’clock at night to take pictures of the night sky. Let me tell you, it’s no easy trick to take pictures of the sky. Firstly you need the right camera for the job, but any camera that can leave its shutter open indefinitely will do the job. Secondly you need a way to keep that shutter open, in my case a handful of rubber bands and tape did the trick. And lastly an excellently clear night sky. After a few pictures of testing out exposure times, which is the amount of time the camera shutter is open, I found that leaving the shutter open for 2 minutes produced pictures with the least amount of distortion. 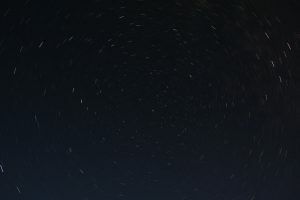 Exposure time is important because the earth moves! You wouldn’t think it, but it moves pretty fast and the pictures that were exposed for more than 2 minutes showed the stars moving across the sky! With this awe-inspiring bit of knowledge I pointed my camera at the North Star and left my camera for ten minutes, I would have left it for longer but my battery was draining pretty fast. In the future I plan to shoot the same picture but for much longer. For now, enjoy my master piece. Hello again! We are back in British Columbia at Kinaskan Lake Provincial Park. It’s been quite a change from Kluane to Kinaskan, from a huge mountainous park to a small, quiet park on the lake. We aren’t missing out on the mountains too much though since the RV campground we are staying at backs onto a nice mountain view and for our day off we headed out for a hike up the nearby Todagin Mountain. The hike started in spruce/aspen forest with lots of soapberry and cranberry underbrush and soon climbed steeply into conifer forest and then subalpine fir and finally into subalpine meadows. It’s always interesting to see how the habitat changes as you hike up a mountain and we were rewarded at the top with amazing views of the surrounding areas including Kinaskan Lake and Eddontenajon Lakes and some snowy mountain peaks. While we ate lunch on the mountain, a group of trail riders rode by on horses and followed the trail down the other side of the mountain. They were out for a ten day hunting trip and the leader told us his grandfather blazed the trail we just hiked up 60 years ago. It was cool to learn a little about the history of the trail we had just hiked and to discover that we had just followed an old Native hunting trail. In the park we are sampling in, there are two lakes that have provided some nice opportunities for bird watching. There are many loons out on both lakes which we have seen and heard regularly. We also spotted a small group of goldeneyes on Kinaskan Lake and we were lucky enough to see them diving and swimming around almost every day we were there. Down another trail, on Natadesleen Lake, we had the opportunity to watch an osprey flying over the lake searching for fish and diving a few times. 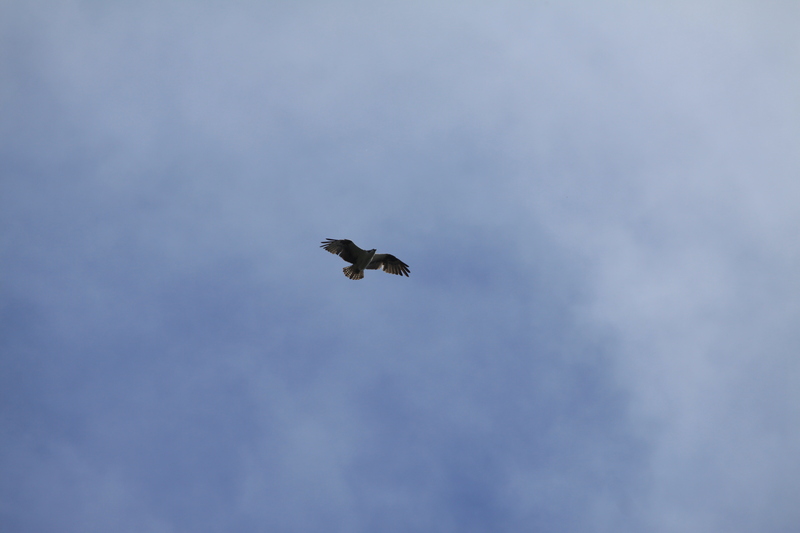 It was awesome to see an osprey in action! The larva of a predaceous diving beetle. One of the highlights of our insect collecting here in Kinaskan was finding some large predaceous diving beetle (Dytiscidae) larvae. We found one of these guys in Kluane and it was a really exciting find and then here at a pond in Kinaskan we caught four more of these huge predaceous diving beetle larvae!! They are pretty spectacular to see, not only because of their size (about 5 cm long), but because of the huge pincers on their head. I was a little nervous handling these larvae because I didn’t want my finger to get caught between those pincers! 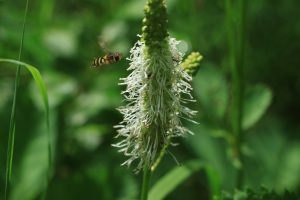 The larvae use them to cling to grasses or debris on the bottom. Here they lie in wait to ambush their prey which they catch with their front legs then bite down on with the pincers. 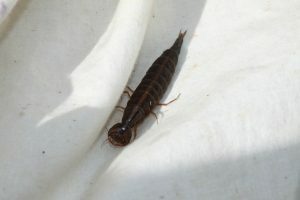 If I were a small creature living in that pond, I would not want to meet one of these beetle larvae! Next we’ve got a two day drive heading south ….Glacier National Park, here we come!